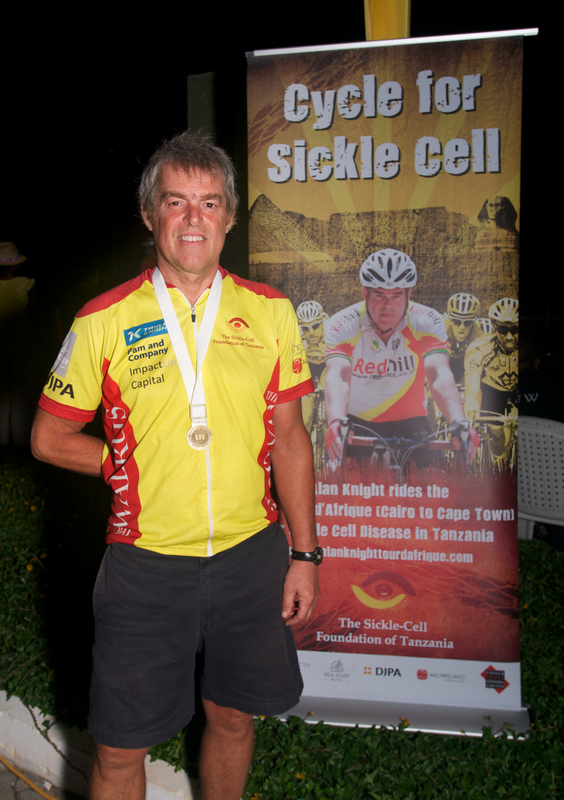 The Cycle 4 Sickle Cell Caravan takes place today in Dar Es Salaam. If you are there I hope you will be able to participate and to support the Sickle Cell Foundation of Tanzania. About 3 nano seconds after I opened my computer at 5:47 this morning I received a skype call from my sister. She lives in Canada so it was only 9:47 the night before for her. In my still groggy, pre-morning-ride state I was broadsided by three fifty- something women screeching like 6-year olds (see the video on facebook). But they had good cause. Mary Porter and Kirstie Carter, two members of Pam and Company and the two ladies in the photo, had just surprised my sister by showing up at her house singing Christmas carols and carrying a huge cheque. Mary and Kirstie had participated in a vendors event that always gives a portion of profits to charity. They had convinced the organisers of the event that ‘Cycle 4 Sickle Cell’ should be the designated charity this year. And it was! So at 5:47 this morning three screeching women (that’s my story anyway) presented me with a cheque for $3,444.39 by skype. Fantastic guys! Thanks so much. But next time, call around lunch time.